Exporter of a wide range of products which include sterile gauze swabs, gauze sterile x-ray detectable abdominal pad, gauze dressing pad swab, gauze swab sterile by eto, non sterile gauze swab and non sterile x ray detectable gauze swab. With an objective to fulfill the requirements of the customers, we are engaged in manufacturing, supplying and exporting Sterile Gauze Swabs. Basically used for minor cleaning and general cleaning in the hospitals, these swabs comply with the standards already set by the industry. Also, our professionals utilize modern machines and premium quality material to manufacture these gauze swabs offered by us. Before the final dispatch, these swabs are tested on different parameters to ensure their flawlessness. 7.5 cm x 7.5cmx8 Plyx4Nos. We are leading manufacturer and exporter of Gauze Sterile X-Ray Detectable Abdominal Pad These gauges are provided at the very reasonable prices to our clients. 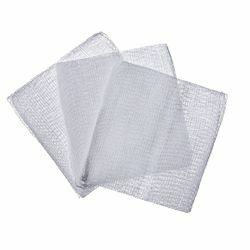 We are leading manufacturer and exporter of Gauze Dressing Pad Non Sterile. 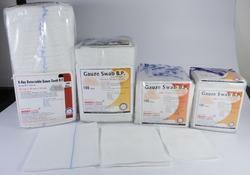 We are leading manufacturer and exporter of Gauze Pad Gauze Swab. 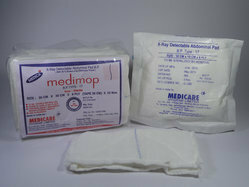 We provide Gauze Pads to cater the need of every Medical Institution. We procure this product directly from manufacturers and hence offer the best deal on such products at very cost effective & timely manner. With X-Ray Detectable and without X-Ray Detectable. We are leading manufacturer and exporter of Gauze Swab Sterile By ETO and We are leading manufacturer and exporter of Sterile Gauze Swablike. The offered pads are manufactured in line with the set industry standards using sophisticated technology and high grade basic material by our skilled professionals. Port of Dispatch: Mundra Port, Gujarat State , India. 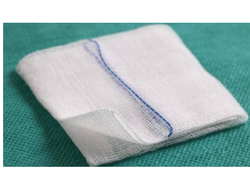 We are leading manufacturer and exporter of Non Sterile Gauze. 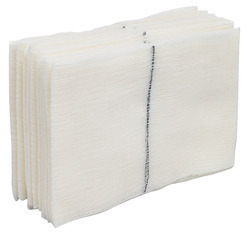 This Non Sterile Gauze Swab that is ensuring with good care for it does not cause irritation to the wound. These products are soft and are used widely in the hospital and other medical clinics. Non X-Ray & with X-Ray Detectable. Port of Dispatch: Mundra Port, Gujarat State, India. 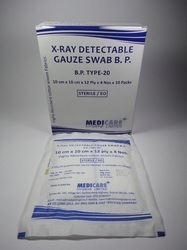 We are the leading manufacturers of Non Sterile X Ray Detectable Gauze Swab. 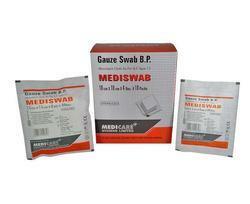 We are the leading manufacturer of X Ray Detectable Gauze Swab BP. We have established ourselves as an eminent name in offering a vast array of X Ray Detectable Surgical Thread. This product is manufactured as per the preset industry norms.